Gov. Andrew Cuomo proposed today a package of anti-corruption laws designed to strengthen measures against bribery, an expansion of defrauding the government and a requirement for public officials to report corruption. “New York state has zero tolerance for public trust violations,” Cuomo said. Flanked by district attorneys in his New York City office, the governor did not propose any means to expand the public integrity powers of Attorney General Eric Schneiderman’s office, powers that both the current AG has sought and Cuomo sought when he held that post. Schneiderman’s 2010 Republican foe, Staten Island DA Dan Donovan, was present at the news conference. Donovan is also the special prosecutor investigating the Vito Lopez sexual harassment case. “Our quest is to maximize the capacity of all offices,” Cuomo said, adding the legislation would help local district attorneys tackle public corruption cases. The proposed bills come after two back-to-back corruption scandals rocked the Senate and Assembly. First, Sen. Malcolm Smith, alongside City Councilman Dan Halloran and several GOP party officials were arrested last week as part of an alleged scheme to buy a spot on the Republican mayoral ballot in New York City. Then came the arrest of Assemblyman Eric Stevenson, who is accused by federal prosecutors of writing being bribed to write legislation that was favorable to developers who wanted to build an adult day care center in the Bronx. Cuomo called today’s legislation the first step in combating corruption cases, adding that expanding the attorney general’s corruption-busting powers may be considered alongside tackling campaign finance law changes as well as electoral reform. “The public expects elected officials to conduct their dealings ethically and honestly and it’s time our laws caught up to reality,” said Manhattan District Attorney Cyrus Vance. The governor said he was hopeful lawmakers could take up the anti-corruption package when they return from their extended break starting April 15. This is the second go-round for Cuomo as governor to tackle ethics and corruption in the state Legislature. Cuomo and lawmakers agreed to pass a 2011 ethics overhaul law that tightened outside income disclosure and created a new public ethics panel that has come criticism for being too secretive and centrally controlled by the administration. Cuomo said his anti-corruption bills won’t end all wrongdoing, but can make oversight and enforcement better. “What we can do and what we must do is everything we can do is to make sure the system prevents abuses,” he said. The legislation Cuomo unveiled today is very much low-hanging fruit, however. The more complex changes would be to end the system of cross-party endorsements and create a public matching system for political campaigns that’s based on the New York City model. 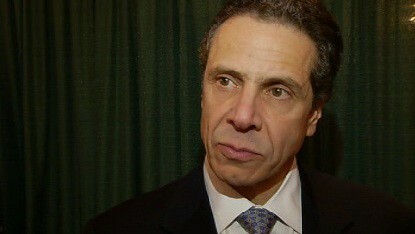 Cuomo has not ruled out the possibility of a Moreland Commission to investigate legislative wrongdoing as well. The Moreland Commission, which has subpoena power, is considered a nuclear option for the governor should the Legislature refuse to move on any of his agenda. Cuomo has used the threat of the commission before when lawmakers and the administration were haggling over the 2011 ethics law. Print article This entry was posted by Nick Reisman on April 9, 2013 at 2:01 pm, and is filed under Andrew Cuomo. Follow any responses to this post through RSS 2.0. Both comments and pings are currently closed. And righteous anger at his 1:00PM DA’s Association announcement today, concerning the recent corruption scandal in the Assembly. We’ve been expecting this from Gov. Cuomo ever since the corruption scandals broke last week with Sen. Malcolm Smith, Eric Stevenson and Assemblyman Nelson Castro. The hour was sweet vindication for all New Yorkers who felt the Governor needed to make a corruption ‘Reform’ package a top priority in NYS Government. Mr. Cuomo made it clear that it just became ‘exponentially’ much more difficult to be a crooked politician in NYS. I’m glad he went in front of the camera and showed the indignation we all feel at this time about corruption in NYS Government. Action today on behalf of the Governor won’t substitute for anti corruption promises left unfulfilled. When Gov. Cuomo implements these reforms, we hope that we can then once again call him a truly ‘Reform’ minded Governor. And for me that means an awful lot, even if nothing ever totally roots out corruption, corrupt politicians will now think twice. Elect “WATSON” in 2014 that is the ONLY WAY to clean Up Albany & NYC. Then we need to ask this question How many members of the press are sleeping with there sources like Barbara Walters ? Then Mort Zuckerman & Rex Smith need to tell us why they endorsed Hevesi the Sunday before the Election ? From The elected officials to the Press the whole system needs to be disinfected. The only solution is to elect “WATSON” & his “ILK” to public office. Are there bills or is this a press release; what are the bill numbers? Ditto. I see no bills on Andy’s news release page. If you’ve got a link, Nick or Liz, please post it. Better yet, call Andy and ask where the bill are. Cuomo’s Public Trust Act is just more faux reform from the King of Bullsh*t. He’s reinventing the wheel for the most part. I DO see that Andy wants the unauthorized use of a computer and unauthorized use of a vehicle to become class C felonies. So…Andy and his co-governor Howard Glaser would have liked to charge DOT engineer Mike, who they recently fired from DOT, with a FELONY for buying something from Amazon via his work computer? That’s RIDICULOUS. Especially when I’m sure that NO commissioner will EVER be charged with a felony for misuse of a vehicle. They’re the prime offenders, you know. We have had COUNTLESS stories of appointees misusing state vehicles. Cuomo appointee Mindy Bockstein and her CHAUFFER driven vehicle come to mind. Did JOPE ever finish THAT investigation or did Cuomo derail it? Probably the latter. Paul Francis didn’t need a chauffer either, when he was part of the second floor either. If you want to be treated like a prima donna, DON’T come to work for NYS. We’ll survive without you. The Legislature should grow a set and let Cuomo’s Public Trust Act die in committee, if it even make it into print. Cuomo is getting more ridiculous by the minute. The “emperor has no clothes.” Tell him so. Liz should ban you and your idiotic posts, ASAP. Watson would agree! Banning is the best weapon the Progressive have to use, Ban all those who oppose them. Silence the truth before others realize that you are correct, call them names, and insult them.